Scouting is unique among youth organizations. One of its most unusual characteristics is that the Boy Scouts of America doesn’t own or operate Scouting units. Ownership of packs, troops, teams, and crews is vested in community organizations that charter each unit, similar to how some businesses have franchises. The BSA provides the program, training, technical help, and special facilities. The chartered organization provides an adequate, safe meeting place and dedicated, capable leadership. Additionally, the chartered organization supports the principles and policies of the Boy Scouts of America. Nearly 11,000 United Methodist Churches are among the organizations that charter Scouting units. Boy Scout Troop 166 and Cub Scout Pack 3266 Scouting are charted by Burks United Methodist Church as its Scouting Ministry. Are physically, mentally and emotionally fit. Have a high degree of self-reliance as evidence in such qualities as initiative, courage and resourcefulness. Have personal and stable values firmly based on religious concepts. Have the desire and skills to help others. Understand the principles of the American social, economic, and government systems. Are knowledgeable about and take pride in their American heritage and understand America’s role in the world. Have a keen respect for the basic rights of all people. Are prepared to fulfill the varied responsibilities of participating in and giving leadership to American society and in other forums of the world. It is the mission of the Boy Scouts of America to serve others by helping to instill values in young people and, in other ways, to prepare them to make ethical choices during their lifetime in achieving their full potential. The values we strive to instill are based on those found in the Scout Oath and Law. One is growth in moral strength and character. We may define this as what the boy is himself: his personal qualities, his values, his outlook. A second aim is participating citizenship. Used broadly, citizenship means the boy’s relationship to others. He comes to learn of his obligations to other people, to the society in which he lives, to the government that presides over that society. A third aim of Boy Scouting is development of physical, mental, and emotional fitness. Fitness includes the body (well-tuned and healthy), the mind (able to think and solve problems), and emotions (self control, courage and self-respect). The methods of scouting are designed to accomplish the aims described above. Later sections describe how Troop 166 implements these methods. Advancement– Scouting provides a series of surmountable challenges and steps to meet them through the advancement process. The Scout plans his advancement and progresses at his own pace as he meets each challenge and advances in rank. Adult Association– Boys learn from the examples set by their adult leaders. Troop leadership may be male or female, and association with adults of high character is encouraged at this stage in a young man’s development. Personal Growth– As Scouts plan their activities and progress toward their goals, they experience personal growth. The Good Turn concept is a major part of the personal growth method of Scouting. Boys grow as they participate in community service projects and do Good Turns for others. Ideals– The Ideals of Scouting are spelled out in the Scout Oath, Law, Motto and Slogan. The Scout measures himself against these ideals and continually tries to improve. The goals are high, and as he reaches for them, he develops self-discipline and becomes aware that he has control over what he becomes. Patrols– The patrol method gives Scouts an experience in group living and participating in citizenship. It places gradually increasing levels of responsibility on their shoulders, teaching boys how to both accept and exercise leadership. The patrol method allows Scouts to act in small groups where they can easily relate to each other. These small groups determine troop activities through their elected leaders. Outdoors– Boy Scouting is designed to take place in the outdoors. It is in the outdoors that Scouts share responsibilities and learn to live with each other. It is here where the skills and activities practiced at troop meetings come alive. Leadership Development– Boy Scouting encourages boys to learn and practice leadership skills. Every Scout has the opportunity to participate in both shared and total leadership situations. Understanding leadership concepts and methods develops self-assurance. It helps him become a more effective youth leader as he accepts greater responsibility for Troop operation, and it guides him toward the citizenship aim of Scouting. Uniform– The uniform makes the Scout troop visible as a force of good and creates a positive youth image in the community. Boy Scouting is an action program. Wearing the uniform is an action that shows each Scout’s commitment to the aims and purposes of Scouting. The uniform gives the Scout identity in a world brotherhood of youth who believe in the same ideals. Work with other adult leaders to bring Scouting to boys. Assistant Scoutmasters (ASMs) are recruited by the Scoutmaster and approved by the troop committee and charter organization to assist the Scoutmaster in troop operation. Assistant Scoutmasters are assigned program tasks by the Scoutmaster and provide guidance to the boy leadership. They also provide the required two-deep leadership (two adult leaders present) at every Troop or Patrol activity. An ASM is assigned to each patrol to help guide and train the Patrol Leader, and to assist the PL in ensuring the scouts in that patrol make continual progress toward ranks and receive recognition for their accomplishments. The degree of involvement of an ASM at the patrol level depends on the leadership skills of the Patrol Leader. For example, new Patrol Leaders may require detailed coaching, while more experienced Patrol Leaders may only need the ASMs to serve as mentors. Assistant Scoutmasters do not “run” or lead patrols. That is the responsibility of Patrol Leaders, with the Assistant Scoutmasters’ guidance. The Senior Patrol leader (SPL) is the top boy leader in the troop and is elected by the Troop biannually, in June and December and takes office after Summer Camp or January 1.. He leads the PLC, and in consultation with the Scoutmaster, he appoints the assistant senior patrol leader (ASPL). A Scout must have earned at least First Class rank to be eligible to run for SPL. The Assistant Senior Patrol Leader fills in for the SPL in his absence. The ASPL, in consultation with the SPL and SM, appoints other junior leaders and assigns specific responsibilities as needed. He is also responsible for training and giving direction to the quartermaster, scribe, historian, librarian and troop guides. The ASPL is appointed by the Troop SPL following the biannual Troop elections. Patrol Leaders (PL) are responsible for giving leadership to the members of their patrols and are elected by each patrol in the biannual Troop elections conducted in June and December, and take office after Summer Camp or January 1. They represent their patrol on the PLC. The PL is also responsible for patrol meetings/activities conducted outside of the regular troop meetings, as desired or needed. Assistant patrol leaders help the PL run the patrol and fill in for him in his absence. The APL is appointed by the PL biannually, in June and December and takes office after Summer Camp or January 1. The troop guide is both a leader and a “mentor” to the members of a new-Scout patrol. He is an older Scout, at least First Class in rank, who helps the Patrol Leader of a new-Scout patrol in much the same way that a Scoutmaster works with a senior patrol leader—providing direction, coaching, and support as determined by the skill level and morale of the patrol leader and members of the new-Scout patrol. The troop guide is usually not a member of another patrol, but may participate in the high-adventure activities of a Venture or other patrols. The Patrol Leaders’ Council is made up of the Senior Patrol Leader, who presides over the meetings; the Assistant Senior Patrol Leader(s), all Patrol Leaders, Troop Guides, and others as determined by the PLC. The Patrol Leaders’ Council plans the yearly troop program during an annual troop program planning conference in July. The PLC meets monthly to develop plans for upcoming meetings and activities. The PLC is guided by the Scoutmaster, and has direct support from and interaction with key Troop Committee members, including the Troop Advancement Chair, Equipment Coordinator, and Activities Coordinator. Read their Scout’s handbook and understand the purpose and methods of Scouting. Attend a parent orientation meeting. Read and understand this Guide for Troop Families and the Troop Bylaws. Take online Fast Start: Boy Scouting and Youth Protection Training at myscouting.org. Actively follow their Scout’s progress (or lack thereof) and offer encouragement and a gentle ”push” when needed. Show support to both individual Scouts and the Troop by attending all Troop Courts of Honor. Assist, as requested, in Troop fund-raising activities. That assistance lowers the cost of the program we offer to the Scouts, as discussed in the “Expenses” section of the attached Troop 166 By-Laws, thereby lowering each family’s annual cash outlay for their Scout(s). Be aware of the Troop program and annual calendar. Volunteer for positions on the Troop Committee and attend Troop Committee meetings when possible. Scouts in uniform are conscious of their rank and make a greater effort to advance. Only the uniform provides a place for display of badges, which are important symbols of achievement. Experience shows that Scouts have more fun, stay in Scouting longer, and feel greater pride in advancement when their unit encourages or requires proper uniforms. By wearing the uniform, Scouts give each other strength and support. Whenever a Scout sees another person in a Scout uniform, he knows he is like that person because both have committed themselves principles of the Scout Oath and Law. The Scout Oath and Law bind all Scouts of the world together in a common purpose. Beyond accenting the common bond between Scouts, by wearing the uniform Scouts are declaring their faith and commitment to important beliefs that bind them to all people. It is a way of making visible their belief in God, their loyalty to our country and their commitment to helping other people who need them. When smartly worn, the uniform can help build good troop spirit. By investing in a uniform, a Scout and his parents make a commitment to take Scouting seriously. The uniform makes the troop visible as a force for good in the community. When properly worn on the correct occasions, it can attract new members. Scouts in uniform create a strong, positive, youth image in the neighborhood, helping to counteract negative feelings some adults have toward youth. The Scout field uniform is to be worn by all youth and adult members of the Troop. The field uniform (listed below) is worn at all scout meetings and in transit to or from any Troop activity. Activity uniforms (typically Scouting-themed T-shirts) are worn in camp and for activities that are likely to damage or greatly soil the field uniform. 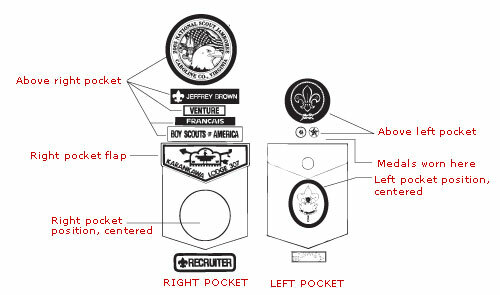 Official placement of insignia may also be found on the inside front and back cover of the Scout Handbook. *Boy Scout-age boys grow rapidly. While Troop 166 doesn’t require official BSA pants, Scouts attending activities beyond the Troop level should wear the full official BSA uniform, including official BSA pants or shorts. Advancement is the process by which boys progress through the ranks in the Scouting program, gradual mastering more and more challenging Scouting skills. Ranks are simply a means to an end, not an end in themselves. Everything boys do to advance and earn these ranks, from the day they join until the day they leave the program, is designed to help them have an exciting and meaningful experience in Scouting. The BSA has established National Advancement Guidelines that Troop 166 and all other BSA units follow. A Scout learns by doing. As he learns, he grows in ability to do his part as a member of the patrol and the troop. As he develops knowledge and skill, he is asked to teach others. In this way, he begins to develop leadership. A Scout is tested on requirements and signed off by the Scoutmaster or any registered Assistant Scoutmaster; a fellow Scout that has attended Troop Youth Leader Training (indicated by the “Trained” patch on their uniform) and is at least the rank being sought; or any other person designated by the Scoutmaster. This would include any adult providing a group teaching experience. Note: If a Scout wants an advancement item tested and signed off by someone other than those listed above, he must first get approval by the Scoutmaster. After a Scout has completed all requirements for a rank, including the Scoutmaster’s Conference, he has a board of review. For Tenderfoot, Second Class, First Class, Star, Life, Eagle and Eagle Palms, the review is conducted by members of the troop committee. An Eagle board of review is also includes members of the district advancement committee, and can include adults from the community who are knowledgeable about Scouting but may not be registered Scouters. The Scout must present himself in Troop 166’s Field Uniform for all Boards of Review. Note: Parents or guardians do not sit on their own child’s board of review. When the Board of Review has certified a Scout’s advancement, he deserves to receive recognition as soon as possible. This should be done at a brief, informal ceremony at the next troop meeting. The certificate for his next rank will be presented to him for formal recognition at the next scheduled Troop Court of Honor. Blue Cards are how Scouts keep track of their work toward Merit Badges and document completion of all requirements. When a scout becomes interested in a particular Merit Badge, he discusses his interest with the Advancement Chair, requests the name of a registered counselor for that Merit Badge, and receives a Blue Card to track his progress. He fills in his name and address, the name of the Merit Badge Counselor*, and the Merit Badge name on the card. Blue Cards have three parts: one for the Scout, one for the Merit Badge Counselor, and one for the Troop. The parts of the Blue Card remain together until all requirements have been completed and initialed by the Merit Badge Counselor. As the Scout completes the requirements, the Merit Badge Counselor records the completed requirements on the Blue Card. When all of the requirements have been met, the Merit Badge Counselor signs the card to certify completion and tears off the Merit Badge Counselor’s section to retain. The Scout returns the other two sections of the Blue Card to the Scoutmaster who signs it to complete the documentation. The Scout then is responsible for giving the Troop portion of the completed card to the Advancement Chair for recording, and for retaining the Scout’s copy for his own record. Troop 166 strongly encourages each Scout to have a notebook or binder in which he retains all records of his advancement, especially his copy of all completed Merit Badge Blue Cards. Those completed, signed Blue Cards are an official record of advancement that can be used to correct any clerical errors that might otherwise prevent a Scout’s achieving rank advancement. *If you, as a parent, are interested in registering as a Merit Badge counselor, please contact the Scoutmaster, Committee Chair, or Advancement Chair. When a Scout advances in rank, he will be recognized as soon as possible – preferably at the next unit meeting. He is recognized formally at a public ceremony called a Court of Honor. The main purposes of the court of honor are to complete formal public recognition for achievement and to provide an incentive for other Scouts to advance. Troop 166 has formal courts of honor four times a year. All families are asked to attend and guests are certainly welcome. Every boy who advances deserves to be recognized in front of his family. The Court of Honor is the Scout’s special night. The outdoors is the best place for learning outdoor skills. How could it be otherwise? A Scout who tried to boil a potato on the gymnasium floor would be in hot water for sure – not to mention the boy who tried learning to swim by reading a book. The outdoors is a great place for learning about living with others. When Scouts walk on the same trail, cook and eat together, and share triumphs and troubles together, they learn important lessons about patience, respect for others’ points of view, doing their full share, making friends more easily, and saying “no” without losing a friend. These are among the “personal growth” skills we want every Scout to learn. The outdoors is where they grow up best. On the trail or in camp, the boy’s leadership skills will be challenged by the real thing – getting their patrols fed and sheltered, keeping them warm and safe, solving the problems they can solve, and knowing when and how to get help for those they can’t solve by themselves. It’s a setting where leadership skills deepen, patrols grow closer, and the troop grows stronger. The outdoors is also a place where a Scout can get closer to the natural world around him – to fully appreciate the land, the forests and their wildlife, the lakes and rivers, the mountains and the seas. In the outdoors he will learn of and understand the “land ethic” – the understanding and respect for the environment we all share, and he will develop an active concern for its health and a willingness to work to keep the environment healthy. Troop 166 has a very active outdoor program; all boys are encouraged to participate fully. Our program includes monthly weekend campouts, an annual long-term summer camp (1 week), day hikes and/or other outdoor activities. All Troop outings are conducted in accordance with The Guide to Safe Scouting and principles of Leave No Trace. The troop function as a Scouting unit on all outings. 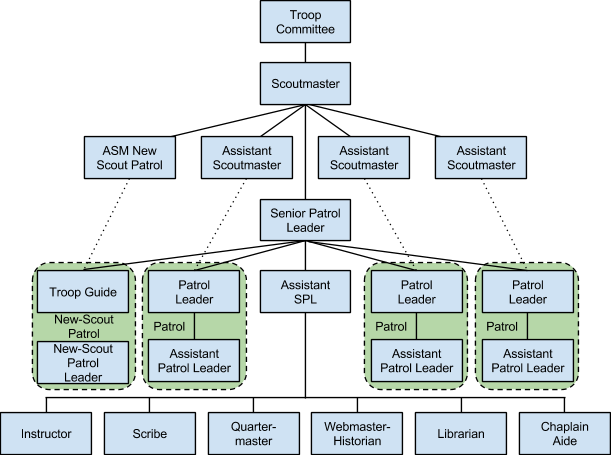 The line of responsibility for Scouts begins with the individual Scout, then his Patrol Leader, and then leads to the Assistant SPL and SPL, with the Scoutmaster having final oversight. Troop 166 also sponsors an annual family outing where all families are encouraged to participate. Parents are welcome on monthly campouts, if space allows. All parents attending campouts must meet the same requirements as the Scouts and Adults Leaders attending, including up-to-date Youth Protection Training and the appropriate current medical records. Parents must recognize the line of responsibility for their Scout described above, except in the unllikely event of an emergency that threatens the safety of their son or other individuals. *Electronic devices are allowed during travel and may be collected upon arrival at the Troop’s destination. Once the Troop has paid for a Scout’s activity, a refund may not be possible. If a refund can not be made, the Troop will attempt to recruit another Scout to take the non-participating Scout’s place and a refund will be made. If a refund can be made, the funds will be deposited into the Scout’s passbook account or, upon request, a check may be written to the Scout’s parent. If a refund is not possible, the Scout will be charged for the activity. Financial challenges should not prevent boys from participating in Scouting. The troop provides opportunities for Scouts to earn their own way through fund raising events. If further assistance is required, parents can request financial assistance through the Troop’s Financial Assistance Program, which is described in the Troop 166 By Laws. Child abuse is a major problem affecting our society. Each year more than 2 million cases of suspected child abuse are reported. This means that 1 percent of American children are experiencing physical abuse, 1 percent are experiencing sexual abuse, and 2 to 5 percent are experiencing emotional maltreatment or some form of neglect. Because of the significance of this social problem, The Boy Scouts of America has declared child abuse as one of the “unacceptables” to receive special attention by those involved in the Scouting program. Educating Scouting volunteers, parents, and Scouts themselves to aid in detecting and preventing child abuse. Establishing leader-selection procedures that prevent individuals with any history of child abuse from entering the BSA leadership ranks. Establishing policies that minimize opportunities for child abuse to occur in the program of the Boy Scouts of America. Encouraging Scouts to report improper behavior so offenders can be identified quickly. Swiftly removing and reporting alleged offenders. The Boy Scouts of America has materials for use in the Scouting program that provide essential information to members and their families. A detachable booklet in the front of The Boy Scout Handbook, “How to Protect Your Child from Child Abuse and Drug Abuse: A Parent’s Guide,” provides information to help families increase self-protection skills. Troop 166 follows all guidelines of the BSA Youth Protection program. All leaders must complete Youth Protection training every two years. Any suspected offenses of the Youth protection program must be reported to the Department of Children Services, 1-877-237-0004 or 1-877-54ABUSE (1-877-542-2873), or to 911 if life threatening. After reporting to Children Services, the Charter Organization Representative, Church Minister, Committee Chairman, the Scoutmaster and the Council Executive are notified. All reports are taken seriously and appropriate action is taken to ensure the safety of the youth. Parents are encouraged to take BSA Youth Protection training which is available at http://myscouting.scouting.org. Parents attending overnight Troop activities must complete Youth Protection Training and provide documentation to the Troop before attending. Everyone, including Scouts, is encouraged to take Youth Protection Training. The Cherokee Area Council Scout Shop is located in the Council Service Center on Lee Highway in front of Sam’s Club. You can purchase scout uniforms and supplies there, or online at http://scoutstuff.org. You are joining a great organization that includes tens of thousands of adult leaders, interested parents, and the BSA professional staff. Scouting is much more than enjoying the outdoors. The Troop teaches leadership skills, teamwork, community service, and citizenship. It provides opportunities for a young man to develop his faith in others and in God, while respecting others’ beliefs. Scouting shows the boys how they can keep themselves strong and healthy and make the most of school. With hard work and dedication, your son will advance to serve as a leader in the Troop and advance in rank along the trail to Eagle. Above and beyond anything else said in this package, your son is in Scouts to have fun! Parents or Guardians of all applicants must meet with the Scoutmaster, an Assistant Scoutmaster, or the Committee Chairman for a personal interview before a boy will be registered with the Troop. The Troop cannot function without the active involvement of parents. Accordingly, the Troop asks each parent to volunteer for a committee or adult leader position, participate in at least one outing or activity annually in a supervisory capacity, and participate as members of Boards of Review, as needed. An annual Parents Meeting is conducted by the Troop Committee Chairman in late October. The purpose of the meeting is to communicate plans for the upcoming year, including the next year’s Activity Calendar, proposed budget and associated fund-raising activities, and to solicit parents’ involvement in those activities. Attendance at this meeting is strongly recommended for the Scouts’ parents/guardians. If you are unable to attend the meeting we ask that you notify the Committee Chairman in advance so we can meet with you later to bring you up-to-speed. An annual new parent/guardian orientation will be convened by the Scoutmaster and Trainer in March (after boys who are moving up from Webelos to Boy Scouts have joined the Troop) to introduce families to the Boy Scout program and Troop 166. Assistant Scoutmasters are recruited by the Scoutmaster and approved by the Troop Committee and the Charter Organization Representative. In addition to the Key Committee Positions, the Troop Committee will seek persons to carry out numerous other tasks such as Uniform Exchange, Ceremonies Coordinator, Awards/Incentives, Transportation Coordinator, Summer Camp Coordinator, Leader Training Coordinator, Data Processing Coordinator, and Webmaster Advisor. The Key Committee Officers shall meet regularly to discuss Troop Business. Meetings shall be scheduled by the Troop Committee Chair who will provide a written agenda at least a week in advance, if possible. Troop Committee meetings are open to parents, registered leaders of Troop 166 and non-Key Committee officers, however, only registered Troop leaders will have the authority to vote. A quorum will exist when the Committee Chair or his/her designee and at least three other registered leaders are present. Youth are represented by the Senior Patrol Leader. Meetings are permissible without a quorum; however, no matters requiring a vote may be decided. A vote of the Key Committee members will be necessary to approve any expenditure of Troop funds beyond the discretionary $100.00 allotted to the Scoutmaster. The committee must approve any interim changes to the Troop’s By-Laws. Should a need arise to obtain committee approval of an expenditure on an expedited basis, the Committee Chairman shall be authorized to contact at least three other registered Troop leaders by telephone/email to discuss the matter and conduct a vote. In any such instance where a telephone/email vote has been conducted, the results of that vote shall be communicated through the current troop communication method and ratified at the next regular Committee meeting. Interim amendments to the By-Laws may be made by a committee quorum after introducing the amendment at a committee meeting and publishing the proposed amendment through the current troop communication method. The amendment will be voted upon at the next committee meeting after the proposed amendment is distributed. Any interim amendment passed in this manner shall remain in effect only until the next Troop Committee meeting where a quorum is present, at which time it will be offered as a permanent change. Activity permission slips and activity money shall be collected by the Scout coordinator for that event and turned in to the appropriate adult leader one week prior to the activity. Signed permission slips and activity payment are required to participate. Activity fees can be charged against Scout passbook accounts if the Scout has sufficient passbook funds available. Parents must indicate their approval of this use of those funds on the permission slip, or must pay the required fees at least a week in advance of the activity. When available, the Troop utilizes Burks United Methodist Church’s vans. When the vans are not available, parents are responsible for ensuring transportation of their sons to campouts and other Troop activities. Carpools will be coordinated when possible; however the ultimate responsibility lies with the parents. All drivers transporting Scouts to events must carry liability insurance in accordance with Tennessee Liability Insurance Requirements for Private Passenger Vehicles. All riders must wear seat belts while traveling as required by Tennessee law. Parents and adult leaders must provide current information about their vehicle(s) and associated insurance to the Troop annually or whenever there is a change in either. The Troop follows the BSA Guide to Safe Scouting guidelines for transportation. The Scoutmaster has the authority and discretion to suspend any boy who refuses to carry out the instructions of the Scoutmaster or his designated representative. In the event of such a suspension, the parents/guardians of the boy will be contacted and must make immediate arrangements to take custody of the boy. The Troop shall not be liable for any costs involved; these will be solely the parents/guardians’ responsibility. Any boy who has been suspended may be reinstated at the discretion of the Scoutmaster, but only after he and his parents have discussed the situation in detail with the Scoutmaster and have developed a course of action to ensure that the behavior will not be repeated. Parents are responsible for picking up their sons after a Troop activity or, at least, to be home if arrangements have been made for the Scout to be dropped off by the Troop. The Troop will not leave a Scout at home after a Troop activity unless a responsible adult is present. If a boy is to be dropped off somewhere other than his residence address or to be picked up by someone other than a family member or the parent of another Scout in the Troop, the adult leader must be informed by the parent in writing prior to the Troop activity (e.g., a note on the permission slip for that activity). Troop meetings are held on Mondays from 6:45 PM to 8:15 PM. Parents are expected to pick up their Scouts in a timely manner. If an activity goes beyond the expected ending time or ends prematurely for any reason, the Troop will attempt to contact the parents/guardians with the updated ending time. Although some older Scouts may have drivers licenses and provide their own transportation to troop meetings and activity assembly locations, the BSA Guide to Safe Scouting Transportation guidelines, those Scouts cannot provide transportation for other minors. Monthly dues of $5.00 (Five Dollars) are payable annually during recharter or biannually in January and July. If annual or biannual payments are a challenge, other arrangements can be made through the Troop’s financial aid process. The dues will be collected by the Committee Chairman or Troop Treasurer and will be placed into the Troop’s general fund. Any Scout who owes the Troop more than $30.00 may be suspended from troop activities. A suspended Scout may be readmitted to troop activities when he pays back the money he owes. A typical field uniform, consisting of a shirt, pants, pants, belt, etc costs $60.00 – $100.00, and is the responsibility of the family. BSA uniforms sometimes can be purchased at garage sales at considerable discounts. Summer Camp costs approximately $250.00. Each Scout is encouraged to earn at least a portion of this money himself through participation in Troop fund raisers or his own enterprise. Each Scout shall pay for his own food for each patrol campout or other patrol or troop activity. Patrols will assume responsibility for purchasing their food for campouts. One person shall buy the food and the other patrol members shall reimburse the troop for the expense before the campout. All payments to the Patrol will go through the Assistant Scoutmaster assigned to that patrol who in turn provides it to the Troop Treasurer. The Treasurer will write receipts to Scouts and return them to the Assistant Scoutmaster who will return them to the Scouts. Scouts and leaders can utilize a troop passport account for Scouting activities. Families can make deposits to the account or money can be transferred from the general fund based on each boy’s fundraising participation and the individual fundraising profit allocation policy approved by the Troop Committee. The fundraising profit allocation is determined by the committee for each fundraising event. A recharter fee and the optional Boys Life fee will be collected annually by the Troop before December 1st of the current year and will reflect the current National registration and Boys Life fees. Current (2014) BSA registration fees are $24.00/year and Boys Life is $12.00/year. These fees are passed through to the BSA National Office. These fees can be paid through the Scout’s passbook account if funds are available and parents/guardians provide permission. Each Scout shall be encouraged to acquire his own personal camping gear. Some gear, like boots, compass, water bottle, mess kit, etc, are important early purchases. Tents and backpacks can be purchased later and are available for checkout from the Troop while supplies last. If an activity is cancelled and the troop can provide a refund, parents shall be asked if they want a refund or if they would like the refund deposited in their son’s account. Once the troop has paid for a Scout’s activity, a refund may not be possible. If a refund can not be made, the troop will attempt to recruit another Scout to take the non-participating Scout’s place and a refund will be made. If a refund can be made, it will be made by depositing the activity cost into the Scout’s account or by writing a check to the Scout’s family. If a refund is not possible, the Scout will be charged for the activity. Rank badges, merit badges, parent pins, etc. Leadership Training Costs for selected Scouts and Leaders (as funds permit). If the Troop is unable to pay for these items due to a lack of funds, the cost may be passed onto the Scouts, Parents, or Leaders, with a 2/3 majority vote of the Troop Committee. The Committee Chair and Scoutmaster may write checks from the Troop’s bank account. The Committee Chair, Scoutmaster, or Advancement Chair may charge against the Troop’s account at the Council Service Center. The troop’s financial records will be audited by a responsible third party annually following completion of recharter, or upon change of treasurer. Financial assistance from Troop 166 is a grant, not a loan, and is provided only for items or fees directly associated with the unit and scouting activities and functions. The Scouting Financial Assistance Program is made possible through unit fundraising activities and donations from members of our community. The recommended budget for the unit Financial Assistance Program is established during the annual planning meeting and may be modified by the Committee during the Scouting year. The unit’s Financial Assistance Program is available to persons who are members or who seek to become members of Troop 166. The level of assistance provided will vary based on the type of request, availability of funds, and the Financial Assistance Committee’s evaluation. Families that receive financial aid are expected to participate in unit fundraising activities whenever possible, as are all scouting families. To the extent possible, applicants should seek funds from other sources before requesting financial assistance from the unit. For example, financial assistance for Council and District activities, registrations, handbooks, and uniforms must be requested from the Council before requesting assistance from the unit. However, funds for strictly unit-specific activities, such as a trip to Cumberland Caverns, should not be requested from the Council. Requests for financial assistance must be submitted to the Financial Assistance Committee using the most current version of the Cherokee Area Council’s Scout Assistance Fund Application form, which is available on the Council website, http://cherokeeareabsa.org. Information submitted on the application must be sufficient for the committee to evaluate its merits. Missing critical information will delay the evaluation process. Requests must be submitted at least three weeks prior to the date funds are needed. Each event or purchase must be submitted as a separate request. All sensitive information provided by the applicant will be held in confidence and will be shared only among the members of the Financial Assistance Committee. If the committee determines that any information needs verification, it will first obtain written approval of the applicant for specific actions required for verification. The Financial Assistance Committee Chairperson will hold records of requests in confidence for a period of one year, and then will promptly destroy those records in a manner that prevents the information from being recovered. To assist in the annual budgeting process, the Financial Assistance Committee Chairperson will prepare an annual report for the Committee summarizing the previous year’s activity, without divulging the identity of any applicant or any other sensitive information. When appropriate, the committee will consider other options such as loaning equipment and supplies, rather than funding purchases. The Financial Assistance Committee will attempt to meet in person within seven days of receiving a request for assistance and to reach a decision promptly. At least three members of the committee must concur to act on a request. If it is not possible to meet in person, the committee may discuss the request by telephone and/or e-mail to arrive at a decision. If discussed by e-mail, each member accepts the obligation to maintain the confidentiality of e-mail correspondence on the request, and to destroy those e-mails once the committee reaches a decision. Without divulging the identity of the applicant or other sensitive information, the Financial Assistance Committee Chairperson will notify the Committee Chairperson of the funding recommendation and will request that he/she seek prompt ratification of the recommendation by a majority of the Committee by having a special meeting of the committee, or by polling members by phone or e-mail. Within five days following action on the recommendation by the Committee, the Financial Assistance Committee chairperson will notify the applicant of the decision and will, if appropriate, provide a letter for use in procuring the item or registration. After receiving the approval letter, the applicant is responsible for procuring the item(s) or completing the event registration, and must provide to the Treasurer a signed invoice documenting the obligation. The Treasurer will make payment directly to the vendor, not to the applicant. If the recipient does not obligate the awarded assistance for the requested purpose and provide documentation to the Treasurer within 60 days of issuance of the approval letter or by the deadline for registration of an event, the approved funding will revert back to the Financial Assistance Committee’s budget, and both the request and committee’s decision will be voided. Decisions of the Financial Assistance Committee are not subject to appeal. Troop 166 expects Scouts to attend as many troop meetings and activities as possible. Active participation in troop meetings and events is important for a Scout’s advancement and leadership development. All rank advancements require demonstration of Scout Spirit; one way that is accomplished is through regular attendance and participation in troop activities. We recognize the many competing demands on a young man’s time that include such things as school sports, band, school and church youth leadership commitments, family commitments, and in some cases part-time jobs, all of which can contribute to a young man’s character and leadership development, but which also may interfere with his participation in troop meetings and activities. A critical part of leadership development in Scouting and a requirement of several rank advancements is that a Scout serve in leadership positions in the troop or patrol. Those positions typically are filled for periods of six consecutive months. Some positions (Senior Patrol Leader, Assistant SPL, Troop Guide, Patrol Leader, Assistant Patrol Leader, and Quartermaster) include greater responsibilities and more interaction with other Scouts than do other positions (Scribe, Historian, Librarian). From a practical standpoint, it is impossible for a Scout to serve effectively as a SPL, ASPL, TG, PL, APL, or Quartermaster during periods when they cannot attend the majority of meetings or participate in monthly outings. Consequently, if a Scout knows that one of his other activities will prevent him from regularly attending troop meetings for periods of a month or more, he should discuss this with the Scoutmaster before accepting the Troop or Patrol leadership position, or as soon as he realizes the conflict. It may be necessary that he relinquish his leadership position to another Scout for that period of time, or make some other arrangement approved by the Scoutmaster to ensure continuing leadership of the troop or patrol in his absence. If a Scout is unable to serve for six consecutive months in a leadership position due to other activities, he will receive credit toward advancement for the time he served. Leadership tenure requirements for rank advancement allow the advancement committee to consider multiple short-term leadership service that adds up to the total duration specified as sufficient to meet the rank requirement. Any adult over 18 years of age must complete BSA Youth Protection Training, prior to attending any Troop outing as a leader or chaperon. After each election, the Equipment Manager and Quartermaster(s) will inventory and document troop equipment. This inventory report will be provided to the Troop Committee and PLC. Any Scout who defaces or purposely damages Troop equipment or facilities must repair or replace that equipment in a timely manner. Parents are financially responsible for the actions of their sons. Annually, Scouts and Leaders must have a current Annual Health & Medical Record. Parts A & B are required for activities less than 72 hours. Part C is required to attend Summer camp and requires signature by a certified and licensed health-care provider—physician (MD or DO), nurse practitioner, or physician assistant. It is recommended that Part C be completed as part of the Scout’s annual school physical. Part D is required to be reviewed by all participants of a high-adventure program at one of the national high-adventure bases and shared with the examining health-care provider before completing Part C. A current tetanus vaccination is required. Scouts must bring enough medications in sufficient quantities and in the original labeled containers for the duration of an activity. They must give them to the activity leader for safekeeping. Make sure that medications are NOT expired, including inhalers and EpiPens. The Scout is expected to understand the medication schedule and self-administer medication unless assistance is needed. Medications will be returned at the end of the activity. Scouts SHOULD NOT STOP taking any maintenance medication during a troop outing unless instructed to do so by their doctor. Physical violence will not be tolerated. At the very minimum, any Scout using physical violence will be issued a verbal warning for their first offense. If a second offense occurs, the Scout’s parents will be called to come and pick up their son. For the protection of all Scouts, the Scoutmaster may determine that a first act of physical violence warrants more than a verbal warning, in which event the Scout’s parents will be called immediately after the first offense to pick up their son. The Scoutmaster may also choose to send the Scout to the Troop Committee for a review of the inappropriate behavior. Harassment, hazing, or bullying will not be tolerated. At the very minimum, any Scout harassing another Scout or person will be issued a verbal warning for their first offense. If a second offense occurs, the Scout’s parents will be called to come and pick up their son. For the protection of all Scouts, the Scoutmaster may determine that a first act of harassment warrants more than a verbal warning, in which event the Scout’s parents will be called immediately after the first offense to pick up their son. The Scoutmaster may also choose to send the Scout to the Troop Committee for a review of the inappropriate behavior of the Scout. Fund raising sufficient to support the Troop is the responsibility of each Scout and his parent. This obligation is separate and distinct from a Scout’s monthly dues requirement. Scouts may choose to satisfy the obligation by participating in Troop fund-raisers, through their own or their family’s contributions, or some combination of these alternatives. All Scouts in the Troop will be afforded ample opportunities to participate in fundraisers, thus ensuring the Troop’s ability to meet its obligations. Fund raising activities shall be supervised by the Fundraising coordinator and will be conducted as needed. These activities will include popcorn sales, Burks United Methodist Men’s BBQ, car washes and other activities agreed to by the Key Troop Committee Officers. Profits from fund raising activities shall be apportioned to the Troop General Fund and/or the Scout’s individual Scout’s passbook account. The Troop committee will decide the profit distribution for each fundraising activity in advance of the event. Individual Scout’s passbook account funds are Troop funds designated for use by individual Scouts for recharter fees, summer camp, training fees and, with the written authorization from a parent and Scoutmaster Approval, for other camping or Scouting-related expenses. Individual Scout account funds earned but not used by the time that Scout leaves the Troop shall be returned to the Scout’s parents. Individual Scout account balance reports will be provided at Troop Courts of Honor or on request from the Treasurer. A fund of $100.00 may be maintained by the Scoutmaster from the Troop general fund as working capital, as available. This fund shall be replenished by the Treasurer only upon presentation of receipt(s). A total expenditure of $300.00 per year must not be exceeded without committee approval. All suggestions, inquiries, or complaints shall be directed to the Committee Chairman.